There is the saying that when you try to please everyone, you end up pleasing no one. I've found this to be true in the translation world, and I know a lot of colleagues who have as well. So, while it's very important to take steps to attract clients (more on that here and here), it's just as important to repel clients who are not a good fit for you and your business. I don't hear many people talking about how essential it is to turn translation clients off. But in reality, it's just as important as finding good translation clients. Once you can pinpoint who your ideal clients are, you can quickly point out the ones who are not a good fit for you. This may sound a bit odd, but it is just as important to repel the wrong clients as it is to attract the ones with whom you prefer to work. So, how can you do both effectively and respectfully? Here are my tips on how to make sure you do this well. Be very specific about your niche(s)/specialization(s). In other words, don't call yourself a generalist, even if you believe yourself to be one for the most part. Just because you may have a variety of clients from more than one industry, you can still narrow down the type of work you do into a couple of specialized areas. By doing this, you are setting yourself up to work only with clients in those main areas. Of course, if one comes along who does not fit these areas of specialization, you can make the call to work with them or not. But the sooner you specialize, the sooner you can repel the clients who don't have a decent budget, who have unreasonable expectations or who simply don't fit the area(s) in which you work. By being very clear about what you do and for whom you work, it will be easier to repel those clients who are less than ideal. Avoid mentioning the type of work you don't wish to do. This may seem like a no-brainer, but I've seen so many translators who advertise an area of specialization or a type of client work on their website that they would actually prefer to stop doing. They tell me that they continue to mention it because they don't want to seem inexperienced or close any doors. "What if that's the only type of work I have right now?" And here's where I'd say, "If you don't want to take on a certain type of translation work, then stop talking about (and accepting) it. The longer you do, the longer you'll attract that kind of work." This concept can be carried over to one's résumé, too. If you prefer not to handle certain types of documents or niche areas, it's best not to even mention them on your CV. Instead, focus on what you do want to do and you'll start to attract more of it. Talk directly to the type of client you wish to attract, and avoid talking to those who no longer serve your career goals. I mention this a lot on the blog and in my T&I Website Blueprint course. It is vital to direct all your marketing efforts, including your web copy and design, to speak to your ideal clients. Talk directly to them, addressing their challenges and pain points and show how you can help solve them. Just as you should avoid mentioning the type of work you don't want to take on, you should also avoid talking to clients with whom you don't wish to start a business relationship. Again, this may sound obvious, but if your web copy is attracting clients you no longer wish to work with on a regular basis, then it might be time to review and revise it. Pay attention to the language you use, and make sure it's fitting for the type of client you want to attract more of in the long run. If you're going to attract your ideal clients, you have to come to terms with repelling clients, too. Not everyone should be a good fit for you. So, the next time you're at a party, and someone asks, "You're a translator? So, who are your clients? 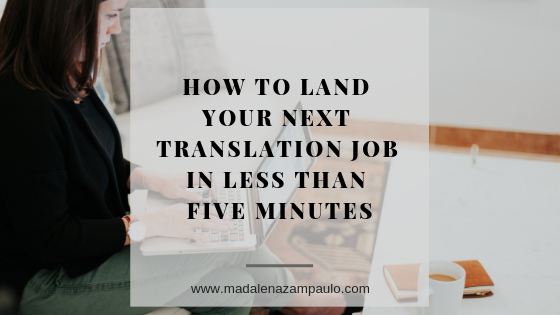 ", try not to give the answer I've heard time and again: "Anyone who needs a [target language] translation." Please. "Anyone" is not your ideal client. The more specific and specialized you are when you describe yourself and your work (both in your marketing copy and when you discuss your work in person), the more you will attract your ideal clients. It's okay that not every client is the right fit for you. This is a good thing. It means that you don't serve everyone. And honestly, who can?! It's important to recognize this and decide how you will start to actively attract (and repel) clients. By making a conscious effort to market to clients by appealing to them directly, you will inevitably start to repel those who are not your target audience. Instead of worrying about losing potential work or income, use the time you would be spending on that client's work by looking for better clients or handling jobs for clients you already value.